No agenda – no hype – where seldom is heard, a discouraging word. This site is about the Yamaha Virago 250, a small motorcycle that is even more popular in the rest of the world than in the US. Almost half of my posts (see “Home” page) now are “All Pictures” posts – I call the series “Virago 250’s from around the World” – which is a collection of pictures of some of the most beautiful and interesting Virago 250’s from all over the world. Some of them are customized, and the talent “from around the world” is amazing. Love the site. Soooooo much great info. Question, my 2001 virago will start and then die once I try to pull the throtle. I’ve just completed a full fluid change and replaced the plugs with the correct ones from NGK. I’ve also run Sea Foam through the engine and added some to the oil. I used your oil combination as well. Do you think I should have the Carb gone through? Possible coil and wires as well? The bike has 9800 miles on it and I doubt anythings ever been done on it. Any advice would be great. I would clean or replace the air filter. I have had problems lately with two vehicles needing air filters when the air filter was not that old. You should try the fuel petcock on the “PRI” position to see if it does better. Make sure to switch it back to the “ON” position. It might need to have the carburetor cleaned, but I would run some more carb cleaner through it first. The normal amount of Seafoam or Berryman’s B12 (costs less than Seafoam) is 1 ounce per gallon of gas, but you should run higher amounts (1/2 bottle per tank) for two or three tankfulls. If it doesn’t get better, then I would clean the carburetor. My guess is that the coil and wires are OK – the problem is probably the carburetor and air filter. I would add a fuel filter, also. Thanks. Great tips. I will do that. Love the site! How difficult was it to remove the rear seat? Is there a hole left from the original bolt? How did you plug it? Removing the rear seat is pretty easy. Just remove the rear bolt, and then remove the seat. It has two tabs that hold it in front – so once the rear bolt is out, the seat comes right off. I plugged the hole with a black plastic cap from Autozone. Thanks Les, I appreciate the quick response! Awesome site. I sold my Virago 250 half a year ago, bought a Vulcan cruiser, but after a visit here I regret that decision. Now I’m gattering money to get a second bike, definitely another Virago 250. For riding through the city etc. Keep up the great work, my hat off to you sir. Thank you for your very kind comments. Glad to see that you plan to get another Virago 250. I have seen pictures of some very nice Virago 250’s from Poland. No he sido capaz de localizar nadie que las fabrique. I have not been able to find anyone to manufacture. Are you looking for a “Miniature Motorcycle” version of a Virago 250 S ? If that is not what you want, can you describe it in a different way, or send a picture ? Hi Les. Thank you very much for answering my email. 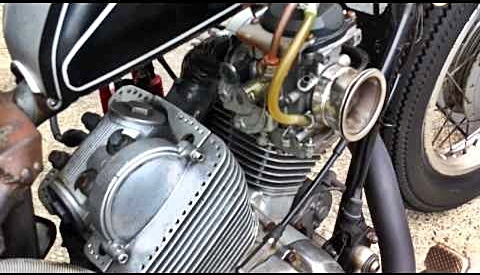 Indeed I am looking for a 1:12 scale miniature of the “Yamaha Virago XV 250”, but unfortunately not the escuentro. I visited all posiblilidades Ebay and Amazon and can not find it. If you think of another possibility, please inform me. If supirera how you send a picture of my bike. I am from Spain. Goodbye. 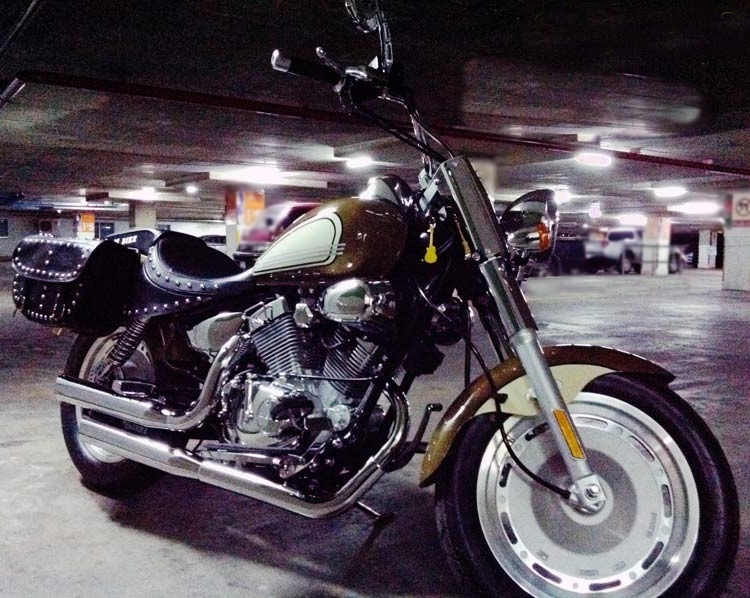 I am just about to purchase a Virago in New Zealand and was wondering how reducing the ride height on the back with Honda Rebel shocks would go? I have seen a lot of Viragos with this done on the net but don’t know whether people adjust the front suspension as well. Also, what underneath the seat?? I want to put on a solo seat with hair clip springs. I wonder if I’ll need a plate that needs to be welded on to cover any wiring etc. I am trying to make a simple bobber and I know that it will look great with a Virago! Cheers and thanks for an awesome site! I love bobbers but have never done it myself. To cover the area under the seat, just make a plate out of black plastic or aluminum. Just use screws to attach it – you don’t want to do something permanent like welding because this panel will need to be removed to change the battery or work on the wiring. If you hit the link at the bottom of this reply, you can see two pictures of the plastic under-seat pan that I made for my XV250. Let me know how it goes…..
does anyone have more information on that last picture, the cafe racer? 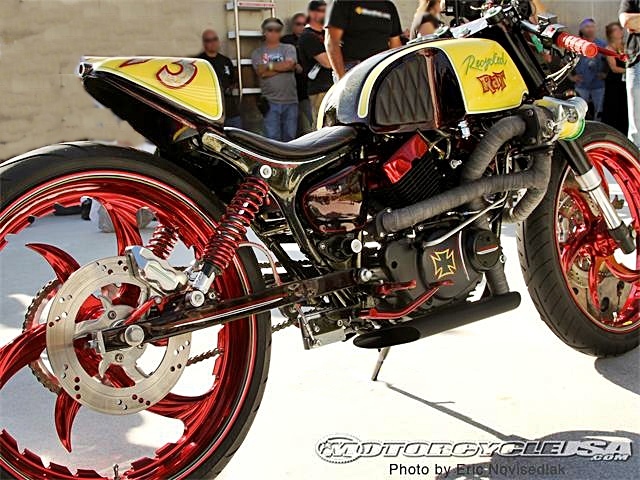 I am looking to do something like that to my Virago 250. I am hoping to find all the specs on that one. Sic Chops out of Lake Havasu, Arizona. Key West must be a great place to own a motorcycle. In a few months we will have snow here in New England, and we will be wishing we lived there…. Hi Les, this is a Keeway 250 rider from China. Keeway Cruiser is not a LIFAN product, It’s from QIAN JIANG (the company which also owns Benelli brand). And Keeway Cruiser now has got a Delphi electronic fuel Injection version, which looks much like a HD dyna switchback. If you send some photos of your Keeway, I will post them. Fuel injection is a good idea for these bikes. I wonder if Yamaha will ever put fuel injection on their xv250? How do i leave a step by step post to show a spring seat modification? 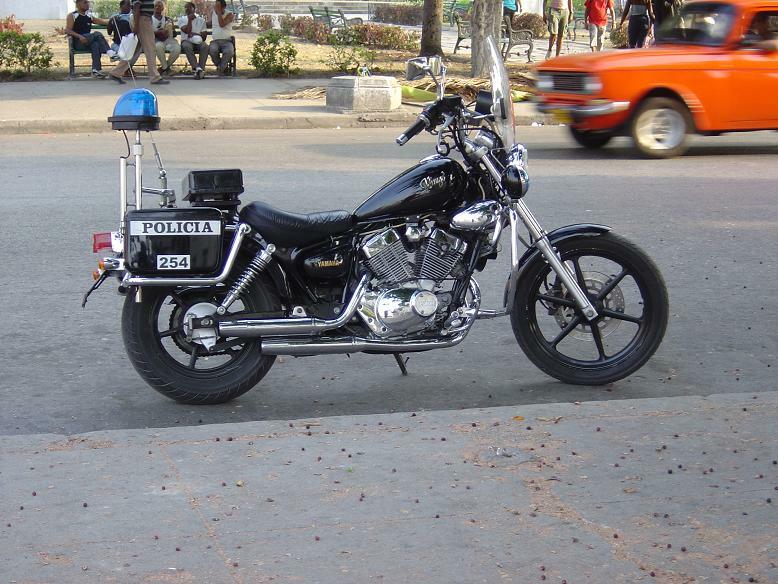 There aren’t too many of these for the v star/virago 250 around on the internet. Just post it as a comment and I will copy it to a page. The small platic tube that hangs from the bottom of the engine (92 yamaha virago 250) fell out on a ride last night. Any idea where its meant to connect to? The bike seemingly runs fine without it. It could be the battery overflow tube. You need it only with the old style battery with the refill caps – and even then it won’t hurt to not have one. Newer batteries are usually sealed and so don’t have the port for the overflow tube. If your battery overflow tube in intact, then check the carb overflow tube.